Everyone who wants to become a member at Tapout Fitness will become a member! We will find a price point and membership terms and conditions that will work with every bodies individual situation, that is a promise! Tapout Fitness believes in providing a unique gym experience, from our decor and aesthetic look, to the boxing and mixed martial arts matches we have playing on the TVs, our facilities leave you with no doubt that you are not in your grandparents gym! Our HIIT boot-camps are fun and effective, and incorporate all the best aspects of our combat sports platform to give you an all around amazing workout that you will not find anywhere else in Georgia, period. Our staff of professional level fighters are all also certified personal trainers, who understand how to incorporate their martial arts and boxing backgrounds into a workout routine for folks who are more concerned about making visible changes in their bodies and level of health then they are in winning the UFC title. We have gym membership rates for literally every budget, from low cost entry level up to high touch one on one and class instruction. We believe in working with everyone to find a price point they are comfortable with for the long haul, so we can make sure fitness is a long term part of their lives. 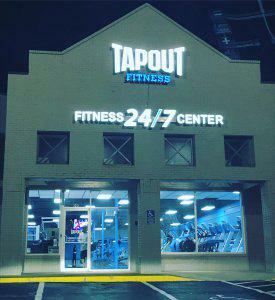 Tapout Fitness 24 hour gym and combat sports fitness center is the most innovative workout program you’ll find anywhere! Stop by today and see what all the hype is all about, and check out our reviews on Google and Facebook at all of our open for business gyms, and see what the community has to say!